Sea level rise is a monumental threat, but one FIU biologist is tracking levels using one of the Florida Everglades’ tiniest residents. Viviana Mazzei is examining communities of algae to help resource managers pinpoint which areas need freshwater most. Known as diatoms, these microscopic algae are a great indicator of environmental changes, including increased salinity and concentrations of phosphorous brought on by sea level rise. Viviana Mazzei examines algae in Everglades National Park. 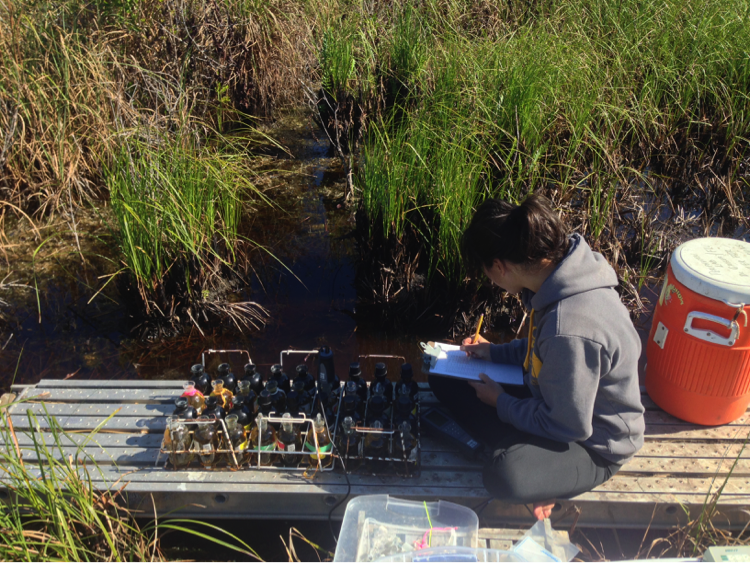 Mazzei is conducing her research as part of FIU’s Florida Coastal Everglades Long Term Ecological Research (FCE LTER) Program which is dedicated to understanding how water, climate and people impact the Everglades. Her research project is funded by Everglades Foundation’s FIU ForEverglades Scholarship. The Florida Everglades is a wetland made up of different ecosystems, including swamps, hardwood hammocks, mangrove forests, pine rocklands and sawgrass marshes. Their interconnectivity makes them especially vulnerable to changes in the environment. In 2000, the U.S. Congress authorized the Comprehensive Everglades Restoration Plan to restore, preserve and protect the water resources of the Florida Everglades. While attempts are being made to restore and redirect freshwater flow in the Everglades, Mazzei says early indicators of environment changes are needed to focus and expedite these restoration efforts.